I know it’s been a while since my last post (see Jaykob’s Native American Party). Things have been quite a whirlwind in the past few weeks, when the pre-school of my daughter, ICBB, asked for some help in styling their Moving Up Day (their version of graduation day). While it was a bit last-minute and entailed loads of details (not to mention last minute preparations! 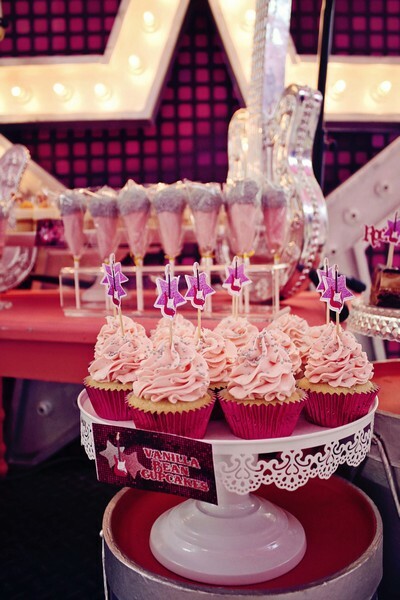 ), the Party Magic team pulled out all the stops and made things happen. Great job as always! I will be posting some very cute photos soon! 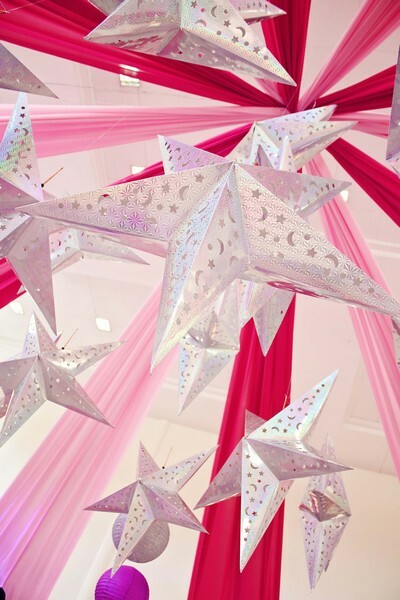 I just got off from a party set-up and feeling very inspired to post some photos! 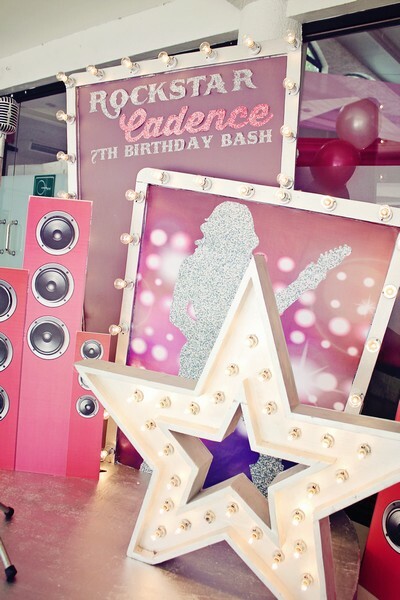 I’m talking about Cadence’s Rock Star Party, and it is the most awesome party we’ve made yet. 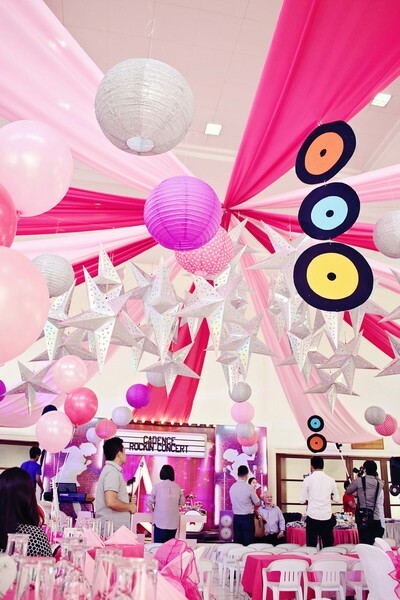 It was held at the Greenhills West Clubhouse, which I think is one of the nicest venues to style. 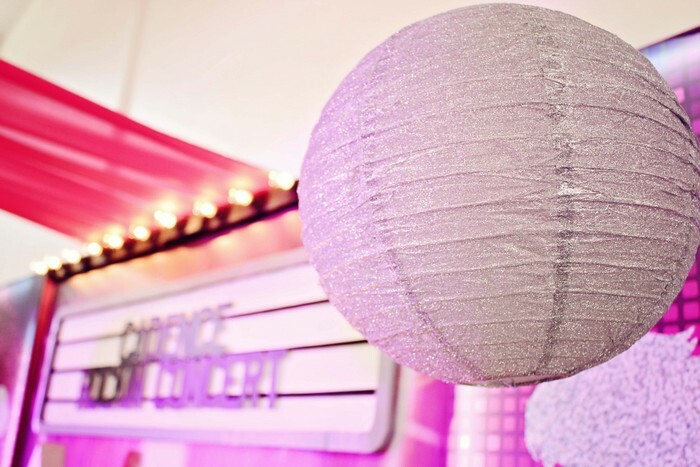 I think what gave this party the extra special touch is the inclusion of the color silver in the color motif. 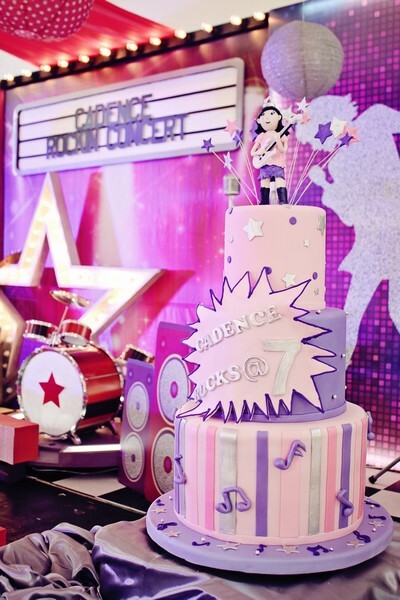 The silver gives the whole event a “harder” overall look which blends in well with the Rock theme as well as the fact that Cadence is celebrating her 7th birthday! Perfect combination of dainty and edgy. 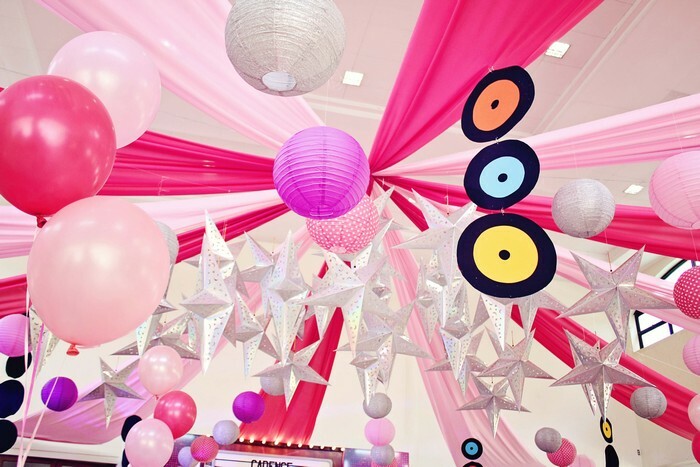 Again, great job by Party Magic on the ceiling treatment. The stars in the center are breathtaking. 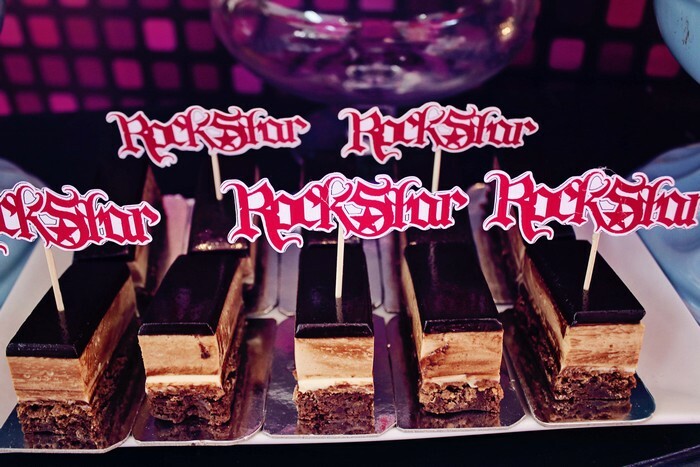 The perfect allusion to being a “rock star”, too! 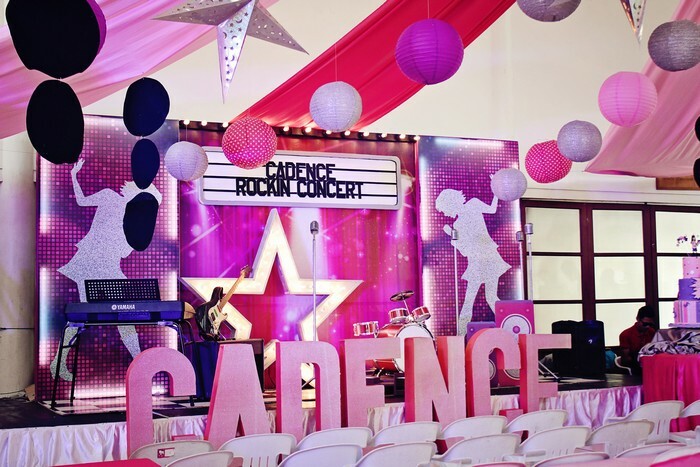 The design was inspired by a sort of mixture between rock and disco elements all under a fuchsia and purple color theme, with just a small amount of black coloring dashed in. 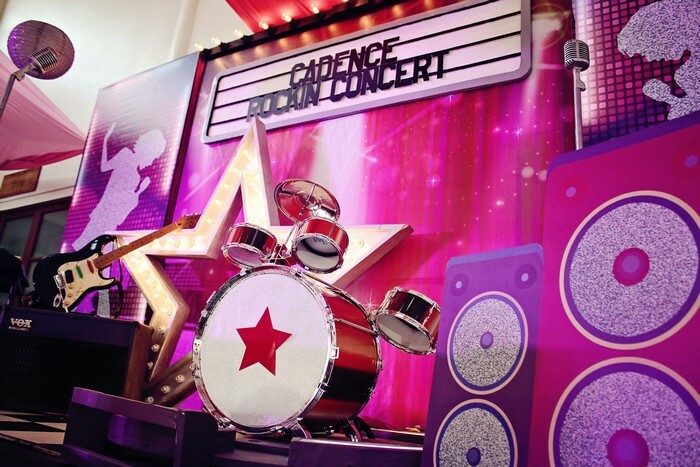 The setup shows a kind of concert stage where a rock band would play, complete with drums, keyboards, guitar, and microphone! 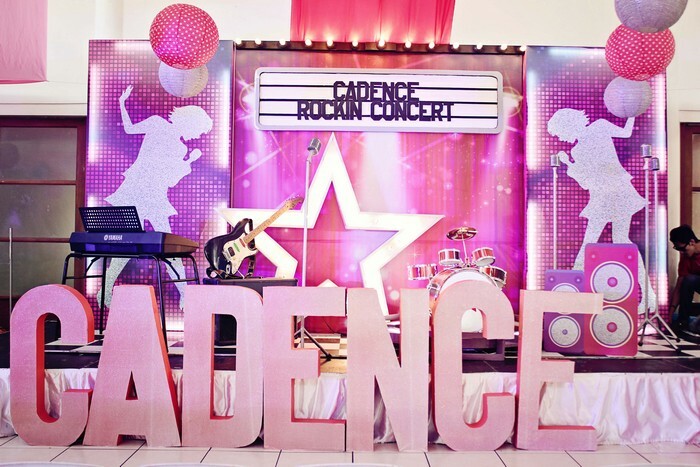 Interestingly, “Cadence” is a musical concept which ties perfectly into the Rock Star theme. Did anybody else get the connection? 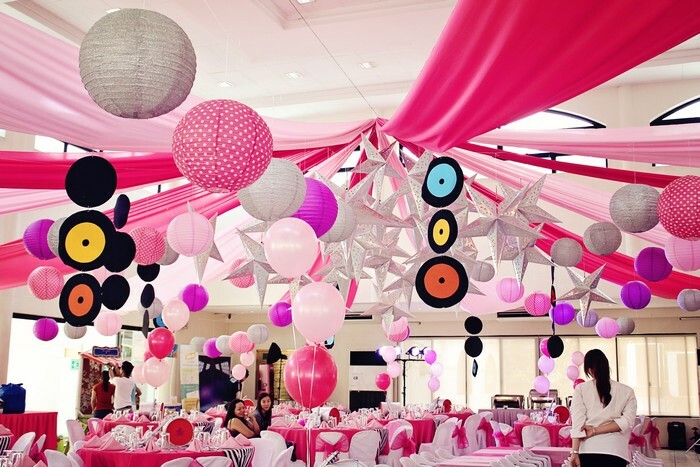 I just love how everything is tied in to the theme in this party! The central graphic (that printed graphic in the center of the background, in the signage area) was inspired by my adolescent years wasted on games such as Dance Dance Revolution and later on its iOS counterpart, Tap Tap Revenge (those were the days!). This is bordered by the silhouette of a female vocalist belting out the songs of perhaps Janis Joplin or for the kids out there, Lady Gaga! I was trying very hard not to do some head banging myself. I think that the central signage here plays a major role in creating the proper visual impression to the guests. 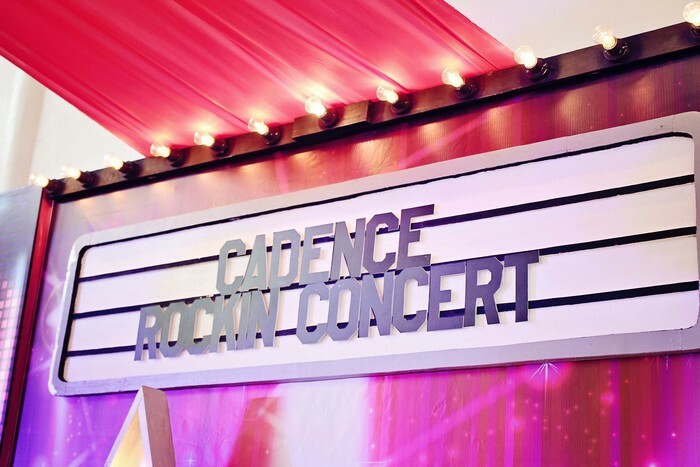 This is the signage that is typically shown outside auditoriums or concert halls. 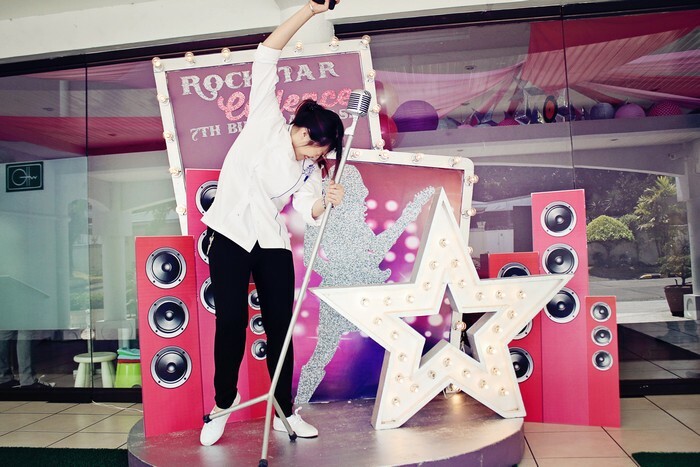 Okay, speaking of rocking it on to the tune of Lady Gaga, Chef Nikki of Simply Paris got into the mood and did some head banging herself! 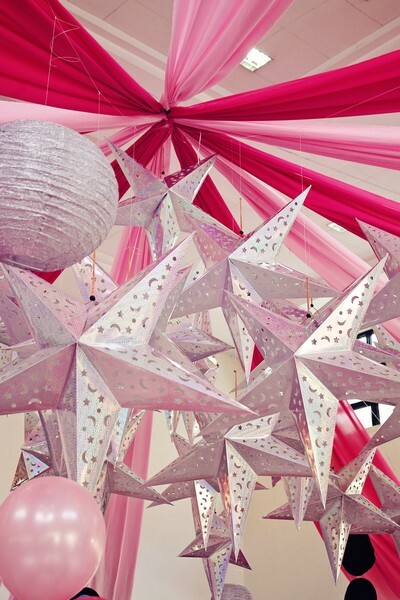 The decor and mood was simply contagious! 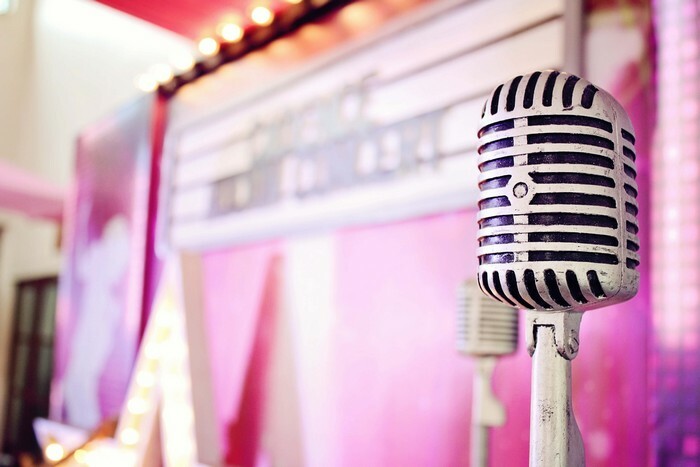 This set-up reminded me and my husband of The Voice. When you’re standing there on the platform, you can’t help but feel your auditioning and praying for those chairs to turn! 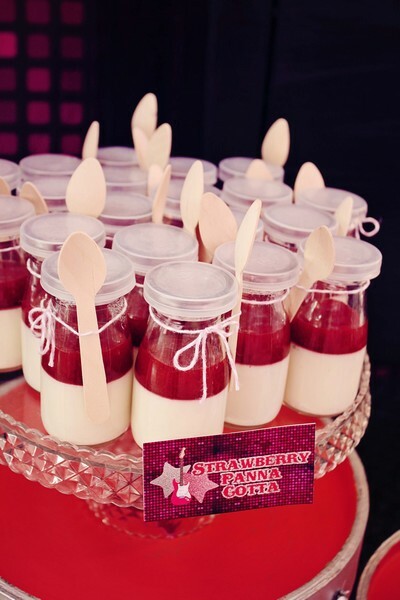 The dessert table was equally lovely. 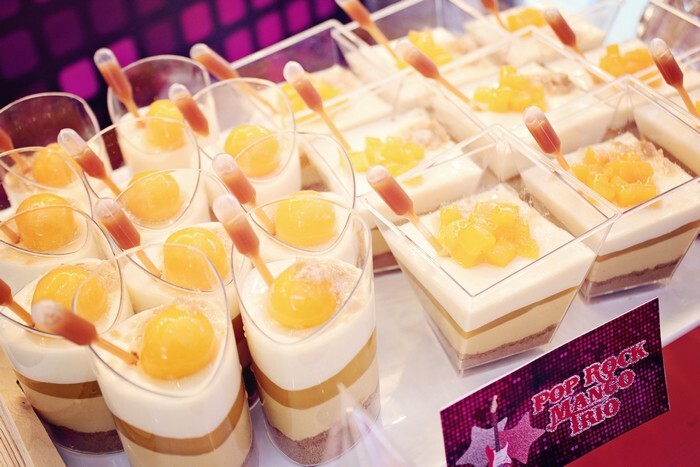 It is consistent and ties in all the major concepts of the theme. The huge star is also present! 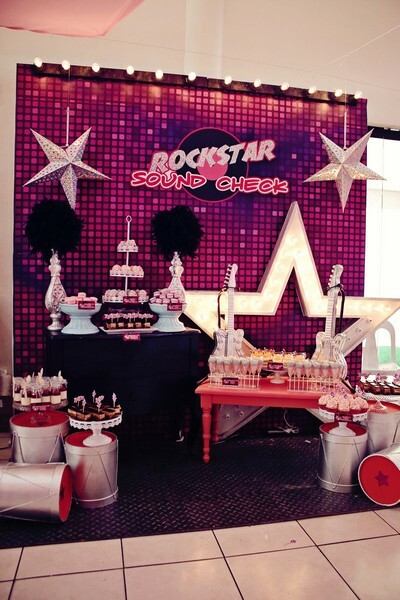 Sweet setup there by Chef Nikki! If you any pastries done for an event, drop her a message in here Facebook page. The happiest of birthdays to the awesome Cadence. Rock on! 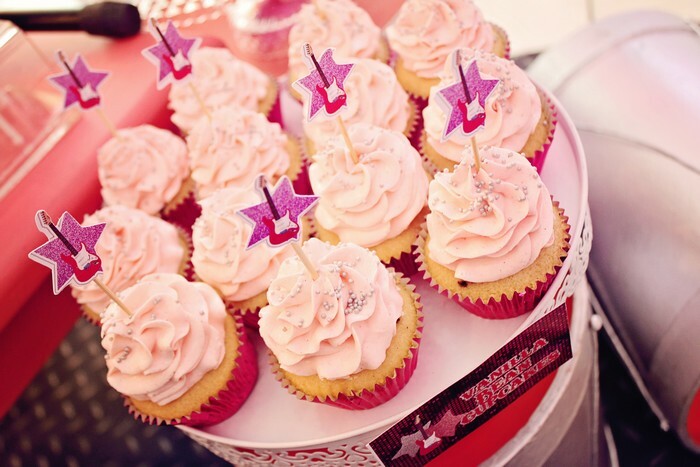 HI, beautiful party. Where did you find the backdrop scene setter with the silhouettes on them? Hi. 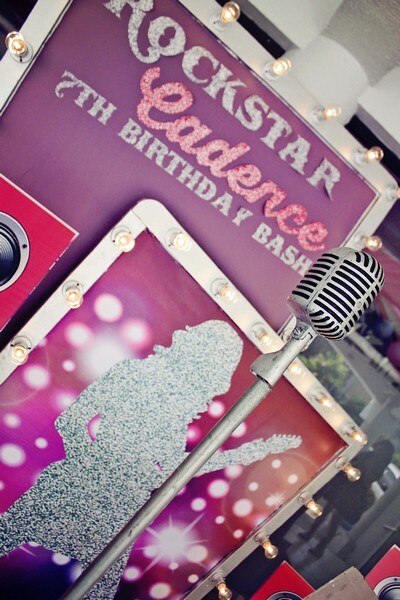 I’m planning a rock party for my daughter who is turning 18 this coming September. She likes live band, color black, purple & blue. Likes to play a ukulele and sing. She’s also an athlete. And a theater club member of their school. May I request for a proposal or quote?